I never would have guessed this. - Adding chaos to the world, one thought at a time. I never would have guessed this. I'm listening to Pandora while rewriting my French paper. If you click on "About this song" you can see similar songs. Normally you get, well, similar songs, but by quite a variety of artists. Today, though, I received this while listening to Ben Folds' "Jesusland". Yeah, who would have guessed that Ben Folds Five were an awful lot like Ben Folds? 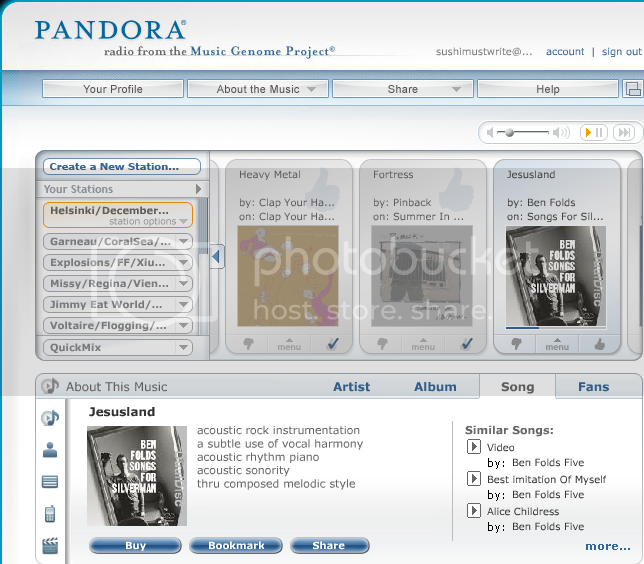 Now, bonus points if you can guess all the artists in the radio stations shown... without looking at my Pandora profile. Hint: the ones you see aren't all of them. Let me tell you, putting my stations on quick mix is an interesting mix. I really should make a few more Pandora stations. Ideas? Also, they are filming here today. OMGWTFBBQ. I'm also at 55k on my novel. It won't be finished for awhile. I love torturing my characters, apparently.